,€œWhat in the world is a Freestyle Bike,€, I asked my nephew when he insisted that he just had to have one for his eighth grade graduation present. Since we have no children of our own (yet!) I had gotten into the bad habit of spoiling my sister’s kids rotten and made the mistake of asking Bradley what he wanted for his special day. Because his response to my question was along the lines of ,€œJust the coolest bike ever,€, ,€œYou can do stuff on it,€ and ,€œIt’s what all my friends ride,€, I felt compelled to do some research before I jumped in and bought him the bike of his dreams. So what is a Freestyle Bike? 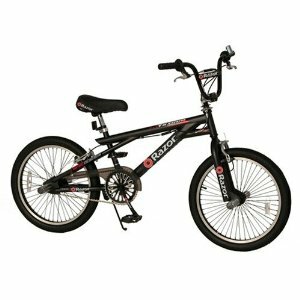 It is a BMX style bike that is designed so that the rider can easily do tricks with it. They can do things like jumping, doing air tricks, wheelies and hops. 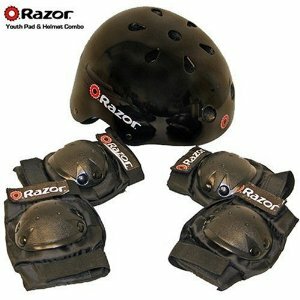 While it all sounded very dangerous to me my sister told me that they always insisted on full padding plus a helmet before Bradley was allowed to be doing any biking whatsoever. Now that I knew exactly what a freestyle bike is I went in search of the best model at an affordable price. I soon found that the Razor FS-2000 Freestyle would be a great fit at a great price. I paid right around $160 from at amazon.com and with their great service the package arrived only a few short days later. My husband, Michael, was in charge of assembling the bike, since we didn’t think it was fair to force that job on my brother-in-law. It literally took under half an hour for Michael to assemble the entire bike. No left over pieces, no jagged pieces protruding, nothing but a spiffy new bike! This bike features solidly built 20-inch wheels which looked truly safe and sturdy to me. Also, it has handlebars that rotate a full 360 degrees which will accommodate the tricks that Bradley plans to impress us with! The pedals looked solid yet comfortable, as did the seat. The look on Bradley’s face when he saw it in his backyard on graduation day was simply priceless. My sister informed him that he must wait at least until the graduation party was mostly over before taking to the streets with his new bike, but once everyone left he was off with his friends. Helmet and pads in place he jumped on his new freestyle bike with all the confidence in the world. He still has some practice to do before he can do tricks like the pros, but seeing him enjoying himself so much brought a smile to my face.